An interesting offshore/nearshore locations strategy dichotomy is emerging for today’s major third-party service providers and enterprise firms, as well as their GICs. On one hand, they are continuing to set up delivery centers in new and unexplored locations due to increasing competition, business continuity planning, and risk diversification. On the other hand, the pressure of new disruptive technologies, changing consumer demands, and need to maintain points of parity with competitors is pushing them to consolidate their footprint in the top 10 locations. In the past few quarters, new center setups in the top-10 locations have jumped by ~10 percent, from 60 percent in 2015 to 70 percent in 2016. The key driver of this change has been availability of talent; only selective locations currently have the capability to support complex digital services. Thus, both external providers and GICs are leveraging these locations for digital services centers and setting up relevant centers of excellence. While several other non-top-10 locations are also investing in building digital talent, they are still not considered a viable option for digital delivery. The major gainers from this shift have been India, Poland, Singapore, the Republic of Ireland, Romania, and Costa Rica. Analytics and cloud are the leading digital services segments in these offshore locations, primarily core software-based analytics. Both types of providers are also building centers in these locations for mobility, social, IoT, and cyber security. The major losers from this shift towards digital have been China and Brazil, given providers’ caution around language constraints and political uncertainty, respectively. While most firms are investing in the emerging technologies/digital space, they are still in the nascent stages of building capability. As they mature, they will start diversifying and distinctively leveraging different locations for supporting elements of digital, thus driving a uniform distribution amongst top-10 locations in the next three to six years. Offshore locations such as Tel Aviv, Cairo, and the Baltic states are currently the ”dark horses” in the race towards the top-10, and will gain momentum in the future. Look for them to deliver regional content contextualization, especially for mobility and social and interactive segments. Some of them will deliver digital technology R&D as well. Recently, corporate developments, such as management changes, corporate governance, and investor activism across Indian IT service providers, have bombarded the investor community. Many investors perceive the initiatives taken by these companies to be a watershed moment in their histories. Furthermore, with next generation automation, digital services, artificial intelligence (AI), and other disruptors creating massive, requisite, and unavoidable change in the IT services industry, investors and service providers are in increasingly opposing schools of thought. However, many of the investment firms we work with struggle to correlate these developments with their investments and returns. Given the scale of the IT industry and the pace of disruption happening in the entire ecosystem, it’s valuable to take a few minutes to dissect and analyze the situation. For the past two decades, Indian IT service providers have reported a stellar net profit margin in the range of 18-25 percent. The business grew on the investments made in human resources. The players achieved impressive returns primarily due to their grip on labor arbitrage. The investor community embraced the stocks, and experienced significant returns. For instance, an investment of US$350 in one of the top Indian IT service providers in 1992 would have yielded US$377,643 in 2015! The emerging IT services model – driven by digital disruptors – gives little emphasis to labor arbitrage or the providers’ earlier factory model, and instead focuses on innovation and value creation for enterprises that extends far beyond greater efficiency. Not many IT service providers have demonstrated a mindset aligned to these new requirements. They are still hesitant to loosen their noose on profitability, as they set investor expectations very high with their earlier business model. Investment firms we work with believe that most disruptive technologies will drive lower profitability for Indian IT service providers likely in the 8-15 percent net profit range. They also believe that technology disruption will not allow the same level of offshoring as before, and will further erode profitability. As most of the Indian IT service providers have zero debt and own huge piles of cash, investors think they should receive distributions in the form of dividends. Their demand is stronger when they learn the providers are going to invest in low-margin digital businesses, as they believe they will not receive the optimal reward they are due. Believing that the market is undervaluing their stocks, IT service providers are planning share buybacks, spinning them as a way to reward shareholders. However, they actually plan to reduce tax leakages caused by dividend distribution, as Indian tax law stipulates they pay a 15 percent Dividend Distribution Tax (DDT) on dividends paid. Additionally, the share buybacks help them increase their control over the company. Both these opposing schools of thought fail to think in the long term. Investors looking for dividends aren’t acknowledging Berkshire Hathaway’s theory of dividends. If a business can deliver promising returns in the long-run, dividends act as a negative catalyst for growth. In an attempt to pacify their investors, most of whom are technology novices, most Indian IT service companies are relabeling their old offerings as “digital.” Instead of dividends, investors need to ask IT service providers’ leadership tough questions on how they plan to use their large cash piles relative to their IP, platforms, acquisition, talent development, and client relationship strategies. How do they plan to differentiate in this crowded market? When large-scale offshore development centers fail to provide the needed competitive advantage, what does their armory contain to create shareholder value? The way in which IT service providers are surrendering to investor pressures gives the impression that they are not willing to utilize their cash for digital technology investments. This in turn reinforces the popular opinion that Indian IT service providers are not confident enough to tide over the current transition. That some of the providers are distributing cash instead of putting the money in beneficial investments is making some market observers uncomfortable. Furthermore, if the providers are not planning to distribute cash, they must ensure that they use the money for useful investments rather than just share buybacks. This is a win-win situation, as the providers get a boost to their topline and ability to endure the current business transition, and shareholders get maximized wealth in the long term. Net-net, firms that invest wisely are going to withstand the changeover, while those that use their cash piles to temporarily shut out investors are likely to witness a tough time. Are these companies capable of implementing the business model? As the adage goes, easier said than done. Although service providers are vocal about re-skilling employees opening onshore centers focused on digital services, the viability of these initiatives are questionable. The majority of these companies have amateur design thinking capabilities, and their DNA is around supplying people, not innovation and strategic partnerships. Indeed, in our recently published report “Customer (Dis) Satisfaction: Why Are Enterprises Unhappy with the Service Providers,” enterprises only gave providers a score of five out of 10 on their strategic partnering abilities. Only time will tell whether service providers made the right move in distributing cash or investing in low-margin businesses. As part of President Donald Trump’s immigration reform efforts, the recently introduced legislation could make hiring H-1B visa holders significantly more expensive. The legislation calls for more than doubling the minimum salary of H-1B visa holders to $130,000. The technology sector is the largest consumer of the visa. And about 70 percent of the 85,000 visas issued every year go to Indian workers employed by technology and outsourcing service providers to provide IT services to leading American enterprises. 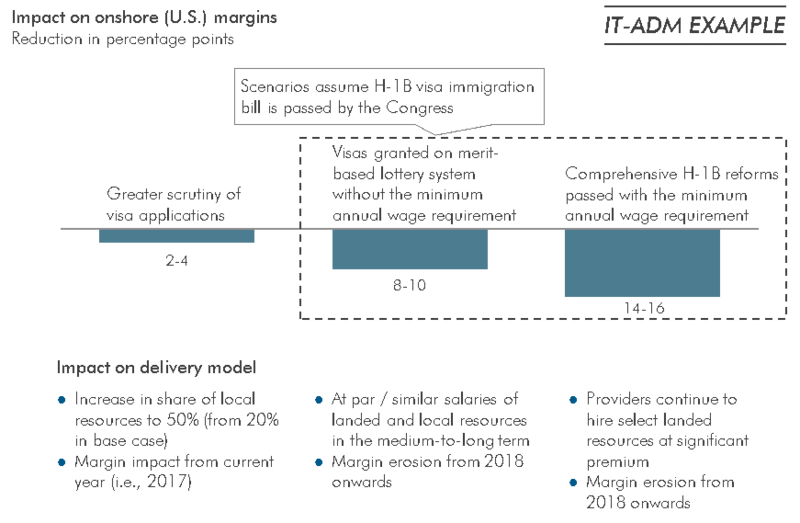 Such a massive hike in the proposed minimum salary for H-1B visa holders is forcing enterprises and service providers alike to rethink their talent strategy from offshore to onshore. Factors such as adoption of agile methodology and regulatory requirements are also driving up the demand for onsite resources, and those will likely need to be sourced locally from within the U.S. as the landed resource model become challenged. 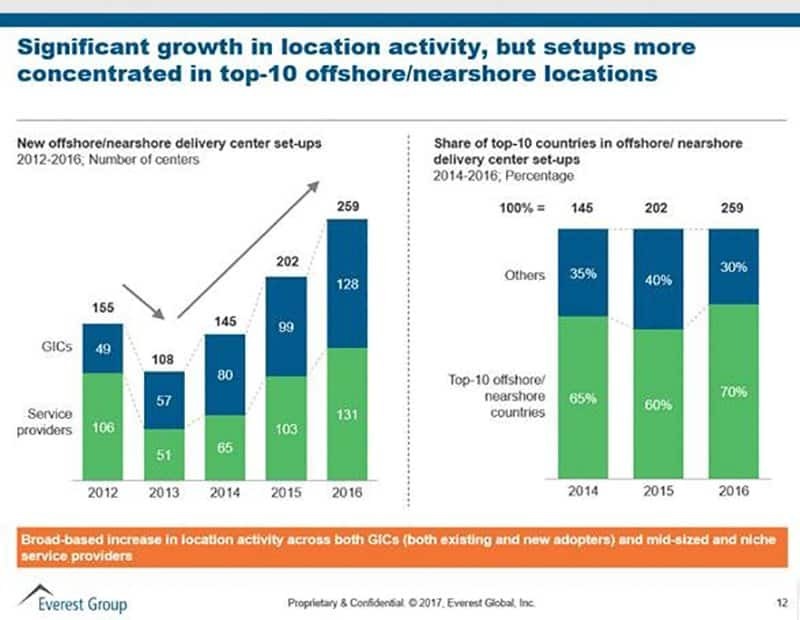 This increased focus on onshore resources has both enterprises and service providers alike considering the merits of potential U.S. locations. The landscape of IT services delivery from within the U.S. is complex, with more than 150 leverageable locations. The help simplify the view, Everest Group has classified delivery locations in the country into various tiers based on socio-economic status, maturity of IT services delivery, talent availability, and operating costs. Deciding on the best location for U.S.-based IT services delivery must be based on a business case that considers multiple factors, and perhaps some trade-offs. For example, Tier-2 locations offer the twin advantage of moderate operating cost and breadth and depth of skills, but you might have difficulty attracting resources with extremely specialized skills to move from a Tier-1 city such as San Francisco to Dallas or Atlanta. And although Tier-3 and 4 locations are suitable for low-cost transactional IT services delivery, they may not be appropriate options if you need, or anticipate needing, more advanced skills. For more information on this topic, please read the following Everest Group reports. 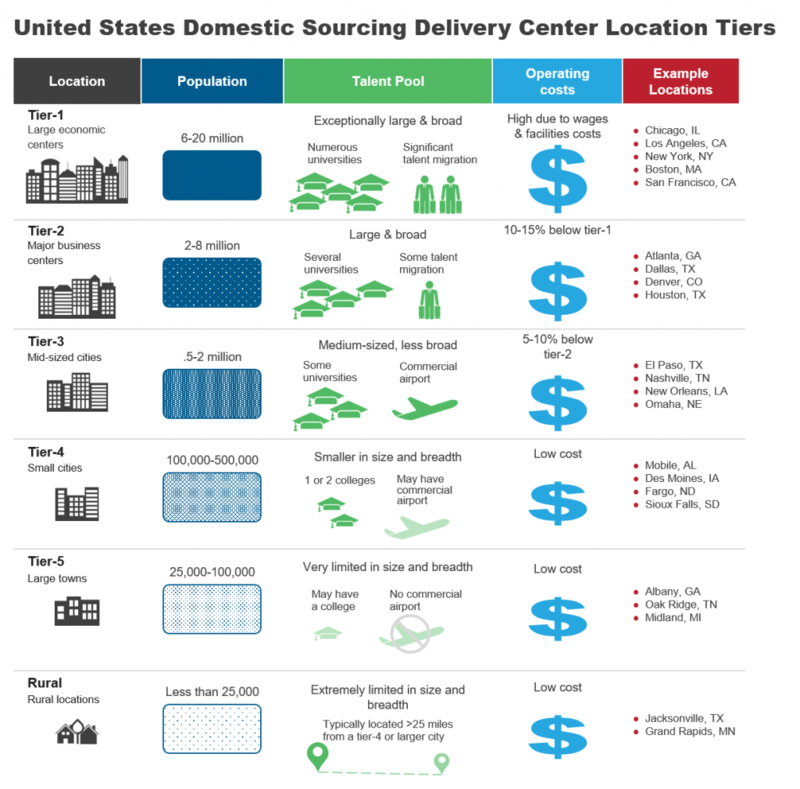 North America Domestic Outsourcing Services: Providers Embrace Onshoring – Is the World Still Flat? Thus far, the banking industry has expressed optimism about the Trump administration’s policy announcements, particularly with respect to potential rollbacks of Dodd-Frank regulations. As evidenced by the positive upswing bank stocks have experienced since the election, the banking industry is thoroughly enjoying the prospects of reduced regulations, expansionary fiscal policy, corporate tax cuts, and increased infrastructure spending. After suffering a decade of challenges and disappointing performance since the 2008 financial crisis, it is no wonder banks would revel in a swing of the pendulum. This euphoria, however, may be short-lived, because some of the potential policies being floated by the Trump administration – particularly as they relate to global service delivery models – have strong downsides that must not be ignored. Chief among the downside risks is the Trump administration’s strong position on US job protection. The cost challenges of the last decade have necessarily led banks’ significant use of offshore labor for back-office business processes and customer contact-centers. In many cases, over 50 percent of the FTE involved in business processes and IT for US banks are in offshore locations. This significant workforce is at risk of becoming the next target for President Trump’s bully pulpit. In addition, the proposed visa reforms and border restrictions will reduce access to skilled technical resources at a cost-effective rate. Or, as Everest Group CEO Peter Bendor-Samuel puts it, visa regulations mean less access to the same cheap labor. 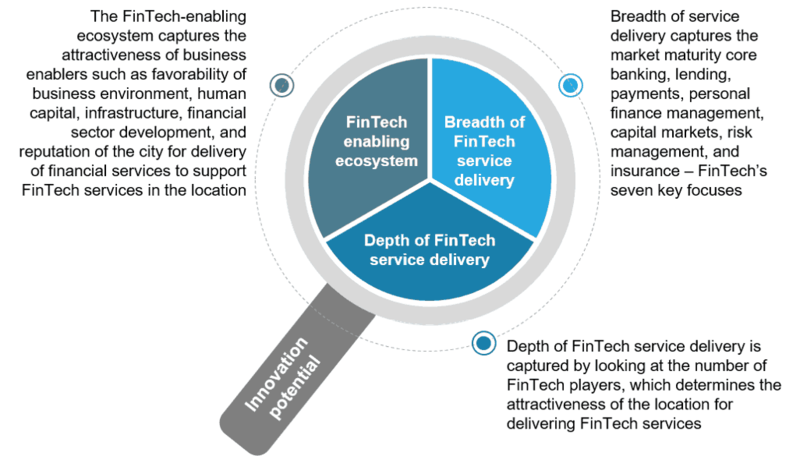 Combining that with the draw of Fintech firms fighting for the same talent, talent scarcity will have an overall impact on the ability for banks to compete in the ever more technology-driven arena of banking innovation. Other risks aren’t as clear but warrant monitoring, including the potential that trade protectionism could ultimately lead to an overall slowing of the US economy, restrictions on the ability to freely move corporate resources internationally, and the tightening of foreign ownership rules. Everest Group cautions organizations in the US banking industry not to buy a pig in a poke, that is, foolishly revel in the benefits of attractive policies without fully examining the impact of policies that may have damaging repercussions. At the very least, banking institutions should investigate the full scope of the political strategies of the Trump administration, consider the implications, and develop strategies to mitigate the potential downsides of those policies. We invite you to view a recording of our recent eye-opening webinar hosted by Todd Hintze, Managing Partner, and Mark Lade, Associate Partner on how Trump policies and other growing protectionist policies will impact your operational strategy. You can also read their complimentary viewpoint on the topic titled Navigating the New World (Dis)Order – a must read about this disruptive topic. Just a month into 2017, the acceptability sentiment toward sending work offshore has changed. Companies are increasingly eager to explore ways to do work onshore which they would otherwise do offshore or is currently offshore. The question is how to do that without creating a negative cost impact.